Private charters for any occasion from as little as $15pp. BYO available! Planning a Hens Night, Bucks Party or just want to get a bunch of friends together to spend an awesome day on Sydney Harbour? Hire one of our Rockfish catamarans and let our legendary crew look after you while you enjoy the views. 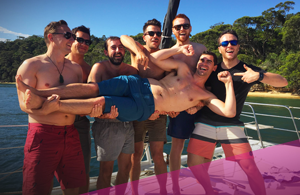 Celebrate your next birthday party on a private catamaran on Sydney Harbour from as little as $15 pp per hour! Morning, daytime or evening cruises available. BYO drinks! 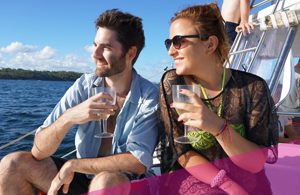 Enjoy a sail & swim bucks cruise on Sydney Harbour. BYO food and drinks and use the BBQ and eskies onboard. Entertainment and waiting staff available! Get away from the office and charter our catamarans for up to 30 passengers – perfect for team building events, relaxed meetings and corporate functions. 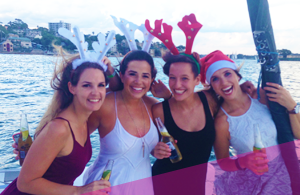 Arrange your Xmas party on Sydney Harbour and get to know your colleagues even better! A great way to say a big thank you to your staff and have a fun day out together. The Light, Music and Ideas Festival is not to be missed! 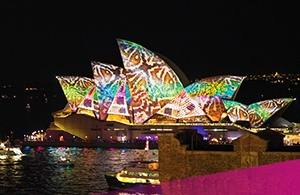 Vivid Sydney is on between 24 May – 15 June 2019. Book a private charter with us today! From just $30 per person!